The deadly earthquake last year in the south Napa Valley was the Bay Area’s most destructive in a generation. It injured more than 200 people and wreaked hundreds of millions of dollars in damages. 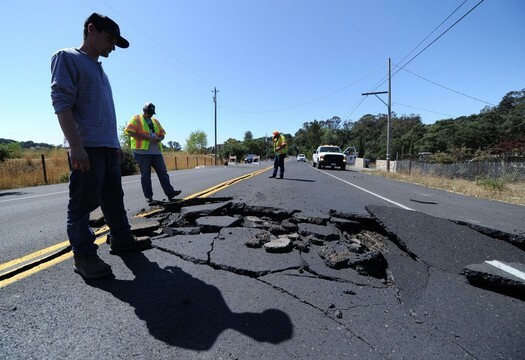 Among those rushing to the scene that morning were geologists hoping to better understand the workings of the West Napa fault zone, which, until then, some had simply written off. Ben Brooks, a geophysicist with the U.S. Geological Survey, says when the earthquake woke him at 3:30 a.m., he went to check on his son. "My little six-year-old," Brooks says, "who asked if there was going to be a volcano afterwards." Brooks hustled down to his office in Menlo Park to grab a truck, and some laser-scanning gear, called "lidar," for light detection and ranging. By driving hundreds of miles around Napa over the next few days, at around 10 miles per hour, Brooks and his colleagues were able to gather a detailed snapshot of the topography. Some parts of the West Napa fault shifted suddenly during the magnitude 6 earthquake, but others crept gradually in a phenomenon called after-slip, moving about a foot over a few weeks. 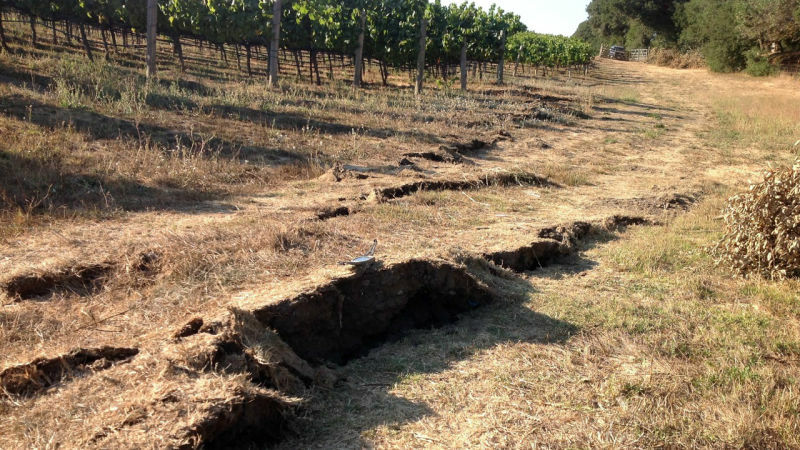 One striking hallmark of the South Napa earthquake has been a crack roughly eight miles long, visible in pavement and in vineyards where the vine rows suddenly zigzag. 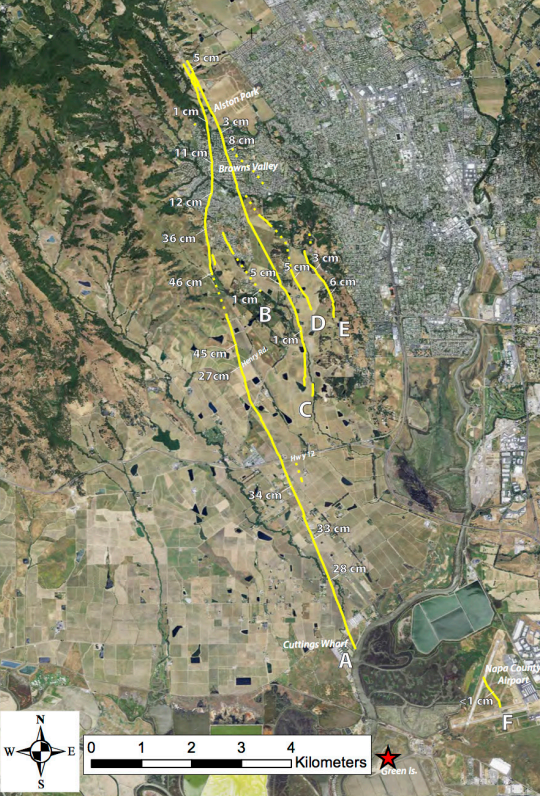 Since the quake, Ponti says mapping by a NASA jet has suggested the crack runs another five miles farther south, toward the salt marshes near American Canyon. Part of what makes the fault zone a mystery is that it has multiple strands running parallel through the same area. And they might not break along the same pattern in another earthquake, Ponti says. 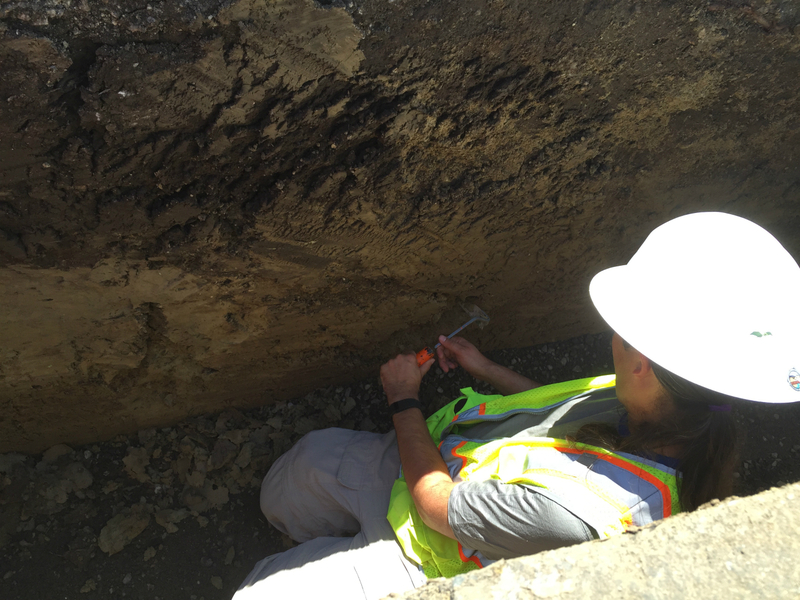 Tim Dawson, an engineering geologist for the California Geological Survey, has been among those digging trenches around 10 feet deep along the fault trace over the last year, looking for buried clues. Such a history helps to inform future expectations, and Dawson says new fault maps out next year could affect where planners choose to permit housing and other development. Curiously, trenching studies so far haven’t turned up much evidence of quakes in the last few thousand years. One effort did find evidence that quakes occurred much further back in time—millions of years, says Carol Prentice with the USGS. “Perhaps back in geologic time this fault was more active—produced more frequent and perhaps larger earthquakes—and now there’s been some kind of change," Prentice says. "Perhaps the slip has moved onto a different fault, and on this particular fault, perhaps now we’re only seeing magnitude 6 earthquakes, and very ­infrequent earthquakes." Or maybe not. In order to figure it out, scientists have to keep digging. Professor Gareth Funning of the University of California, Riverside, has been watching the region around the West Napa fault zone for years. Until last year’s quake, he says, it was such a bit player that he felt comfortable just leaving it out of his analysis. That makes the after-slip all the more puzzling. If the West Napa fault is capable of substantial, rapid after-slip, Funning says, it could also be capable of creep, or gradual movement of a fault unaccompanied by any big quake. But if there are any signs of movement before the quake happened, Funning says he hasn’t found them. More over-flights have been underway this month, to monitor the subtly shifting terrain and compare it to predictions. That's especially important to homeowners in Browns Valley, where the fault rupture went right under some foundations. “We’re going to also be picking up some areas where there’s damage to the levees in the Sacramento River Delta area back at the time of the earthquake, so we're trying to understand that," says USGS research geophysicist Ken Hudnut, who first forecast how the fault would continue to slip in the aftermath of the quake last year. Can We Have a Seven-Point-O? This is not the first time an earthquake in the area has had people rattled. Fifteen years ago, a magnitude 5 quake centered around Yountville toppled chimneys and injured dozens of people. A seven is a major earthquake. It would be just a notch stronger than the deadly 1989 Loma Prieta earthquake.